Courtesy of Dananjaya HettiarachchiDananjaya Hettiarachchi, the 2014 Toastmasters International World Champion of Public Speaking. It doesn’t matter if you’re shy and soft-spoken or brimming with confidence and energy — if you don’t prepare properly for a presentation, you’re not going to connect with your audience. 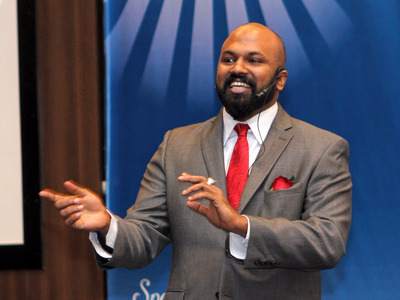 To help you out, Business Insider asked the 2014 Toastmasters International World Champion of Public Speaking, Dananjaya Hettiarachchi, for his best advice on how to prepare, whether it’s for a presentation in front of your team or a speech in front of hundreds of people. Two years ago, Hettiarachchi survived seven rounds of a competition that lasted six months and included 33,000 competitors from around the world. He continues to go on speaking tours, and regardless of the content or length of his speech, he follows the same five basic principles. You should be able to get your presentation’s thesis down to 10 words or less. Hettiarachchi said that there are two approaches to developing a speech. In the first, you write your speech as an essay and practice it until it becomes memorized and conversational. The second, which he prefers, is starting with a speech off the top of your head and then refining it until you are happy with writing it down. With a recorder in hand, Hettiarachi will focus on a message and then begin speaking spontaneously. He’ll listen back to his speech, making note of what needs improvement and then begin again. Even if your presentation is to your colleagues and is based on a PowerPoint slideshow, you shouldn’t have your title be a throwaway phrase. It needs to immediately pique the curiosity of your audience. Novice speakers tend to get wrapped up in themselves, droning on without a point because they’re afraid of engaging the room full of people before them. You need to begin your presentation with confidence, and jump right into your message. Hettiarachchi practices grabbing the audience’s attention within 45 seconds by imagining himself from the perspective of a stranger who has no inclination to stay and listen to him. A presentation needs to be for the benefit of your audience, and making it too complex will leave even a sharp crowd confused. Hettiarachchi argued that the larger your audience, the simpler your speech should be, since its power is based on how effectively you can make a connection with everyone sitting in front of you. To keep things clean and concise, Hettiarachchi recommends that your presentation never have more than five main points you’re trying to get across. For him, three main points to drive home his message is ideal. Audience members tend to remember best the last section they heard in a presentation. It’s why Hettiarachchi said it’s so crucial for novice public speakers to plan their endings and to go out on a high note.